You know when things do what they are supposed to do well? They might not be the best or the most groundbreaking, but they do what they're supposed to and, most importantly, are enjoyable. That's Wolfenstein: New Order. When Wolfenstein: The New Order was originally announced, it didn't really register on my radar. I'm not actually sure why, to be honest. Maybe I'm tired of shooters or shooters with Nazis. Maybe the game just seemed like a place I'd been to before, showing me something I've done previously. From what I saw today at the Tokyo Game Show, Wolfenstein: The New Order delivered an enjoyable gaming experience. 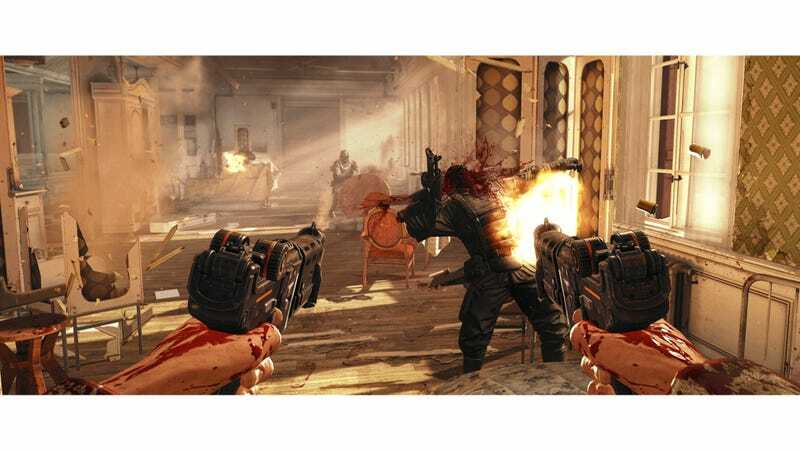 During the demo I played, Wolfenstein: New Order didn't seem to be out to reinvent the wheel. That's not what the game wants to do, and bless the game's developers for keeping things familiar enough and at the same time pushing forward with smart game design and fun play. As it is with these things, your mileage may vary with the final product. In the demo, you start out climbing up the side of an old castle, shooting enemies that pop out of windows. The rest of the demo was making your way through the castle, shooting baddies who appear in doorways. There's dual-wielding, and yes, we've been here before. Old castle. Nazis. FPS. But that's not the entire game—there are different settings, different style of enemies, etc, etc (see top image). If Wolfenstein: The New Order is paint by numbers, the TGS demo had pretty good paint and nice numbers. I'm interested in seeing what the rest of the game has to offer.